The colours of Menton. Is it any wonder I love it so much?! Les couleurs de Menton. Est-ce étonnant que je les aime tellement? No, it isn't--I love this photo. I fully understand/ agree with you! Just beautiful! Some of my friends fail to understand why I keep going back year after year to this most beautiful place. Your photographs should convince them why. Oh, and can we keep this place as secret as possible from the hoards of holiday makers that flock to resorts west of here?!! Your photo looks like a fine watercolor... An alley scene would not be as exquisite anywhere else in the world! Love the soft pastels accented with charcoal and black... The sign is incredibly appropriate for this scene! What beautiful colors! Even the laundry contributes to the scene. Why is it that laundry hanging in an alley way in Menton is so charming, while here it is so frowned upon??? I love this photo...love the sign below the garments...d'Art!!! And it's so nice to think that I'll get to see it this year. Better have my lenses clean. Really looking forward to welcoming you to Menton, Bob. 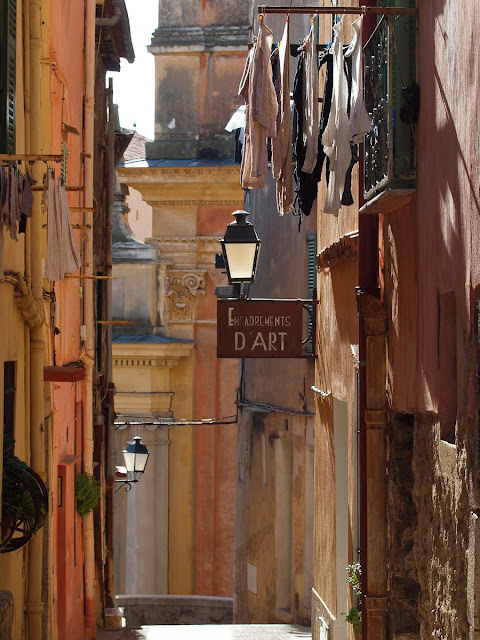 This is an iconic scene in Menton with the basilica just showing at the end of this tiny street. We'll make sure you get to this very place. I'm just smiling with pleasure at this. Lucky Bob! It would be very hard not to love these colors ! No wonder Jilly, no wonder ! Anyone would fall in love with this. The light here is just right, the colours are singing and I'm finding myself singing too! I have never doubted your love for this fabulous place. This proves it. Now right now, tuck this one in a file for your next exhibit. IT IS A MUST!! !